« How my 93 yr. old history teacher got to address the Japanese people. My 93 yr. old history teacher/WWII survivor told the Japanese that he did not think he would have survived another close encounter. Mr. Peachman and author, at debut book signing, Aug. 8, 2015. Mary Rozell photo. 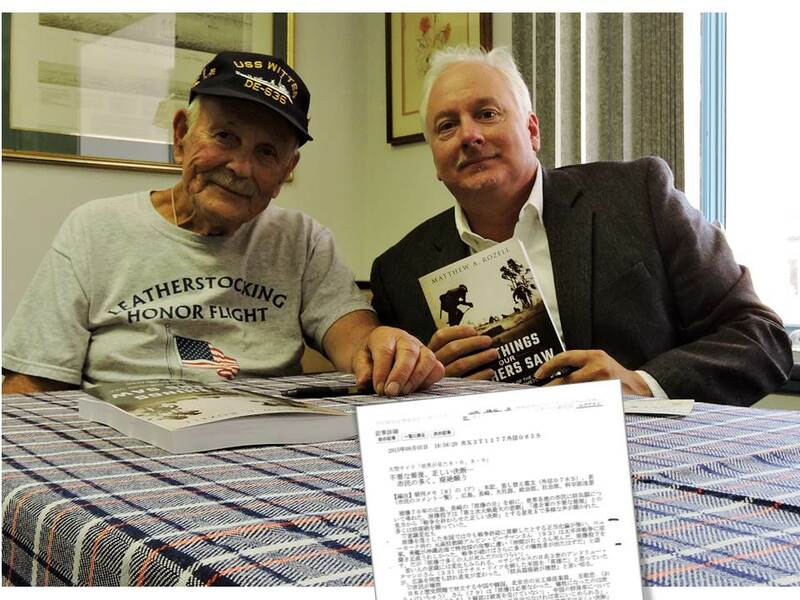 As the book ‘The Things Our Fathers Saw ‘ went to press, I was contacted by the Japan’s largest news wire service, “with over 50 million subscribers worldwide, publishing articles in Japanese, English, Chinese and in Korean…” They wanted a veteran’s “reflections as we approach the 70th anniversary of the double bombings of Hiroshima and Nagasaki” (which he offers in the book, Chapter 13, ‘The Kamikazes’). So, seventy years after the war, Mr. Peachman got to address the Japanese people. The story is below. I called him to ask him how it went. Mr. Peachman and author, at debut book signing, Aug. 8, 2015. Article in Japanese in foreground. Mary Rozell photo. Thank you so very much for all of your help and for putting us in touch with Mr. Peachman. As I explained to you both it was part of a series of short interviews conducted with people from around the world on the subject of views on the atomic bomb. In addition to Mr. Peachman, whose comments we wrote about, we also spoke with a third generation Japanese American in LA, a former factory worker in Beijing, a female university student in Seoul, a high school teacher in Hong Kong who was involved in the protest movements, a former office worker in Germany, a Professor Emeritus from Israel, a young Iranian whose parent was a writer and a former preacher from Scotland. We are so appreciative of our conversation with Mr. Peachman and because of the importance of what he said, he was mentioned at the top. Please see the Japanese article with the mark indicating the part where he spoke. In Summary: we simply explained that many in the U.S. believe that the atomic bomb was necessary to help save lives and that Mr. Peachman was aboard a ship off Okinawa when it was attacked by Kamikaze planes. He lost some of his crew mates and upon hearing the news that the bomb was dropped was relieved because he did not think that he would have survived another encounter with the Japanese. Although he is saddened by the deaths that occurred in Hiroshima he did believe that it did save lives. I hope this is helpful to you and please pass along our appreciation to Mr. Peachman and we also thank you so much for putting us in touch with him. Matthew Rozell’s career as a history teacher is now spanning four decades. Over the course of the past 20 years, he and his students conducted hundreds of interviews with the World War II generation. One such interview led to the reuniting of a train transport of Holocaust survivors with their American liberators, over 60 years later. He is currently working on a trilogy of narrative histories based on these interviews. 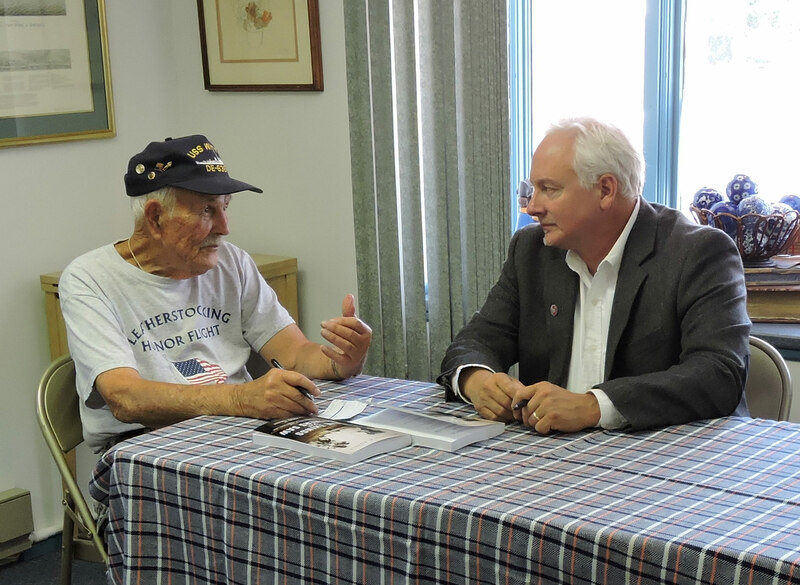 His first book, a narrative of World War II in the Pacific as told through the previously unpublished recollections of over 30 veterans, was released in August. It is available here. His second book, in progress, is on the power of teaching, remembering the Holocaust, and the real story behind the iconic photo of the “Train Near Magdeburg’. He can be reached at his Facebook page at Author Matthew Rozell or by commenting below.